Oops, well I spoke too soon. I thought this topic was over, until I was reading the discussion again, and realized I forgot to talk about wire shapes. There are many shapes for wire, and different shapes work in different gauges. There is the most popular round (like a circle) shape which Agape Gift's uses the most. The second most-used shape would be square, which is not usually purchased in larger than 18g because it does not bend well. There is also half-round, which looks like a circle split right down the middle. We rarely use rectangular wire, or specialty wires. there are some wires with designs imprinted on their face, or even with two half-round metals fused side-by-side which gives an interesting texture to the piece of jewelry. The reason we don't use those, is because here at Agape Gifts, we can make our own textured wire. You read that correctly; Agape Gifts's head designer, Laura Langlois, has the needed stamps and tools to texturize and personalize any wire, metal, or changeable surface. Jewelry wire is in general brass, copper, silver, gold, silver-plated, gold-plated or gold-filled wire. This wire is sold in several sizes, called gauges (based upon a standard called the American Wire Gauge in the US), with the larger gauge wire being smaller in diameter. You can view the different sizes of wire here. For making jewelry the most common gauges are 16, 18, 20, and 22 gauge. 24 and 26 gauge are used, but less frequently. For making permanent wire components, Agape Gift's uses 16, 18 or 20 gauge wire most frequently. For connecting wire components with the wrapped bead link, frequently 22 gauge wire will be used. Sterling Silver Tarnishes easily in the presence of sulfur compounds like those found in air pollution. It is harder to take pictures of sterling silver jewelry. Jewelry made in solid gold has very high perceived value. Gold can be purchased in soft or 1/2 hard. Gold is naturally tarnish resistant. Solid gold is very, very expensive. It is considerably more expensive than sterling silver. Argentium sterling silver has a natural tarnish resistance. Argentium sterling silver when tarnished, the tarnish is a light yellow color and can be washed off with soap and water. Argentium Sterling Silver is more expensive than ordinary sterling silver but is far less expensive than solid gold. Argentium Sterling Silver comes from the manufacturer with a light coating of tarnish. It is recommended that you wash this wire with soap and water before you use it to make jewelry components. Gold-filled wire appears and wears exactly like solid gold. Gold-filled wire is slightly stronger than solid gold. Gold-filled wire can be purchased in soft or 1/2 hard. Gold-filled wire has the same natural tarnish resistance as solid gold. Gold-filled wire has 5% gold alloy squeezed around a gold colored metal core. For this reason the gold on the wire can not be scratched off by normal wear and tear. Gold-filled wire costs more than sterling silver, but much, much less than solid gold. Silver-plated wire appears like sterling silver for jewelry items that receive limited abrasion like earrings. Some silver plated wire has an anti-tarnish enamel coating. The silver plating is 1-2 molecules of silver thick and can be scratched off by normal wear and tear. Silver-plated wire is only available as soft wire. Most silver-plated wire contains traces of nickel. Gold-plated wire appears like 24 kt gold and is suitable for jewelry items that receive limited abrasion like earrings. Gold-plated wire appears like 24 kt gold and can be hard to match to jewelry components made of other gold alloys. The gold plating is 1-2 molecules of gold thick and can be scratched off by normal wear and tear. Most gold-plated wire contains traces of nickel. Soft wire can be used to make spirals and other rounded shapes. Soft wire can be used for any application. Some it will do well some less well. Soft Wire isn't easy to use when wrapping wire around other wire. Soft Wire doesn't make sharp bends easily. Soft wire generally requires hardening of the finished piece. 1/2 hard wire wraps tightly around itself or other wire. 1/2 hard wire makes sharp bends. 1/2 hard wire requires less hardening of the finished piece. 1/2 hard wire can not be used for making spirals. 1/2 hard wire requires that you push the wire beyond where you want it to end up, then remove your hands and test to see where the wire ends up once it has relaxed. Finished Pieces made in hard wire require no hardening. Hard wire is very difficult to work with. Hard wire can not be used for making spirals or other rounded shapes. A way Agape Gifts alters the durability of wire is by hardening the wire. Just as during the manufacturing process wire can be made in one of several hardness's, when making jewelry, Laura, our wire artist, can change the hardness of a jewelry wire component. Most of us have experience in breaking a wire coat hanger by bending it back and forth many times. With the coat hanger, we were changing the hardness of the wire by "work hardening" it. Each bend increased the hardness of the wire until we saw one of the drawbacks of very hard wire -- it became brittle and broke. With our jewelry wire components we want to make them permanent, so we frequently want to increase the hardness of the wire. This happens naturally as part of manipulating the wire into shape by work hardening. We can use nylon jaw pliers to help with this manipulation and by squeezing the piece in the jaws of the pliers we can work harden the piece. We can also significantly increase the hardness of the wire by hammering it with a chasing hammer or nylon hammer and anvil. When making ear wires, using a chasing hammer will be an important step to set the round portion of the ear wire and make it permanent. Another jewelry making issue to discuss is durability. Jewelry wire is relatively soft by comparison with glass or stone. The inside of glass or stone beads have small microscopic irregularities that act as the teeth on a saw and will ultimately cut thread or smaller jewelry wire. Over time and with heavy wear, glass or stone beads can saw through wire. Agape Gifts uses a bead reamer to remove most of the microscopic ridges inside the bead. Bracelets and rings seem to be most vulnerable to this sawing action. In general, it is easier to make a wrapped bead link with thinner wire, but thinner wire is less durable. Agape Gifts uses 22G jewelry wire for making the wrapped bead link, but for a piece that will get a lot of wear, Agape Gift's will use a thicker 20G wire. With inexpensive wire, like copper, brass, or Artistic Wire, the wire is generally made in only one hardness -- soft. With more expensive jewelry wire like sterling silver, gold, or gold-filled wire, the wire is commonly manufactured in one of five hardnesses -- soft or 0, 1, half-hard or 2, 3, or fully hardened or 4. 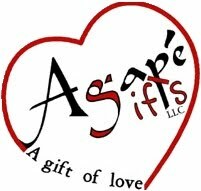 Agape Gifts generally uses half-hard or hard wire according to the project. Soft wire bends easier than half-hard wire and tend to remain in place once it is bent. Half-hard jewelry wire is somewhat springy and tends to spring back some once it is bent. Soft wire is perfect for making spirals and other rounded shapes, but doesn't make crisp angles. Half-hard wire makes crisp angles and wraps around itself well, but because it is springy, it must be pushed beyond where you want it to end up. Almost all jewelry wire in the US is sold in sizes defined by the American Wire Gauge. In this standard as the gauge of the wire increases, the size of the wire decreases. As an example 16 gauge wire is much larger than 22 gauge wire. As the wire gets larger, or the gauge gets smaller, the wire becomes harder to bend. Simply put, it is easier to bend thin wire than it is to bend thick wire. In general, wire components for earrings are made in 20 gauge wire, wire components for bracelets are made in 18 or 20 gauge wire, and wire components for necklaces are made in 16 or 18 gauge wire. 18 and 20 gauge wire are relatively easy to bend and durable enough to stand up to the wear necessary. There are many different types of wires. Wires vary in gauge (thickness), hardness, shape, and malleability. Here at Agape Gifts, we will try our best to thoroughly explain each of their differences. This post will explain the different techniques and methods that make Agape Gifts jewelry individually unique.